My own vision of Nottingham Castle from movie 'Robin Hood: Prince of Thieves'. It's my last one creation for CCCX. 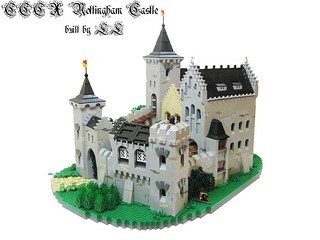 This for Castle category. I already posted on your flickr page, but again this is awesome. Always a fan of your work and this is great. I saw this a few days ago on flickr as well, and this is indeed still awesome. It has a storybook feel to it that I really like. This is an excellent castle! 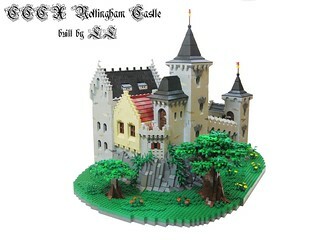 The base is great and I really like how the castle is built into the rockwork. The trees and bushes are a nice touch as well. I would have to say this is your best yet! In addition to the excellent architecture in the castle, I really like the cleanly built landscape. It shows the castle off well. Beautiful! I love the angled walls. Superb, simply superb! A great castle floor-plan with brilliant color choices and detail. Keep it up! This is why your castles are among my favorites. Brilliant stuff sir! 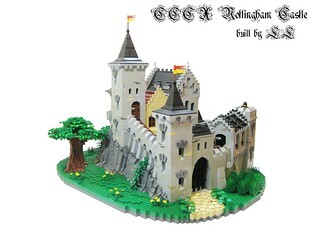 The base is really eye-catching, how it's so well-rounded and blends with the castle is amazing! This is a beautiful clean build. One of my favorite castles in a looooooooong time.